I'm almost done! I have half the hem and the zipper to do. I decided to hand-pick the zipper, as I have trouble with invisible zippers. I think my zipper foot is a bit too wide--it does say on the instructions that you need their special zipper foot for a proper zipper installation. 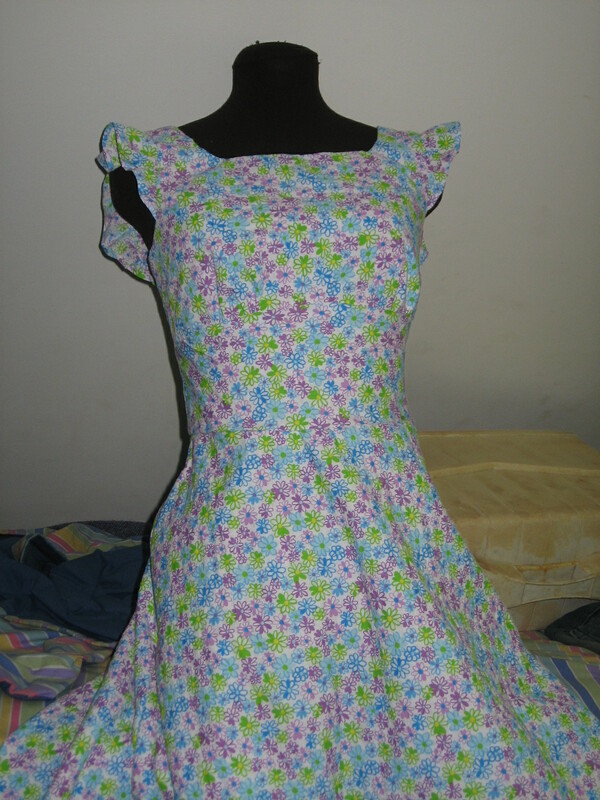 This dress is quite fitted, and it's making me realize how pathetic my dress maker's dummy is. It's wider than I am in the shoulders and bust, which is where I have most of my fitting issues. Plus it doesn't have a stand, so I have to awkwardly prop it against the wall, which is bad for taking photos of things with skirts. (Case in point: photo to the left.) However, I don't know that getting a replacement is practical either. I figured out today that my shoulders are different heights. Getting a dummy that reflected that would mean getting a custom made one, which is far out of my budget. I've been toying with the idea of making a duct tape dummy, but I'm not convinced I could do a good job of that. I didn't alter this pattern much at all. I cut my usual mish mash of an 8 at the bust, a 10 at the waist, and a 12 at the hips. 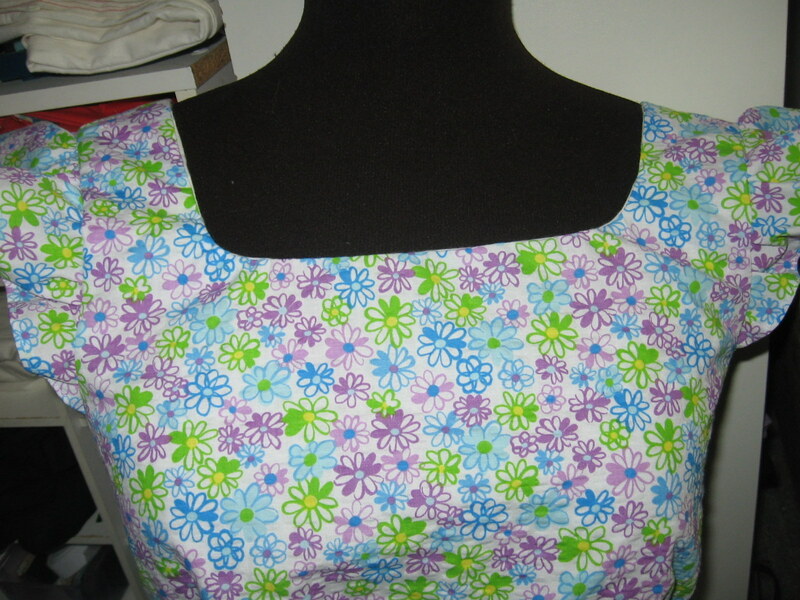 I took a little width out of the upper back while installing the zipper to make the fit tighter, but I think I may have deviated from the pattern to do that--the pattern envelope calls for three inches of ease, which I thought didn't look so nice with this style. The bodice of this dress is interestingly constructed. There aren't any bust darts or anything like that, just the gathers you can see in the photo on the right. This works quite well for someone like me, but I think someone with a fuller bust than I might have an issue with the pattern as drafted. I'm quite sure this isn't drafted for the standard B cup, anyway. Also, just because it's funny, I'm showing you a picture that shows how slanted the neck of this dress is on my dummy. I find it highly amusing that I never noticed how off my shoulders were from each other before. Sewing has taught me so much about how incredibly oddly shaped I am! I think this dress is just bordering on the too childish. I think the print combined with the ruffles is pushing the envelope a bit. While I don't have a problem with "childish" clothing, being an 18 year old who regularly gets pegged as being somewhere between the ages of 12 and 15 has its disadvantages, so I try to stay away from outfits that make me look even younger than I am. The skirt (which you can't see properly in any of the photos) is a nice classic A-line which rescues the dress from being all together childish, though. On the whole, I'm very pleased with this dress, and barring any disasters in the zipper and the hem, I'm pretty sure this will become a wardrobe staple. beautiful. I love the cut of the dress. 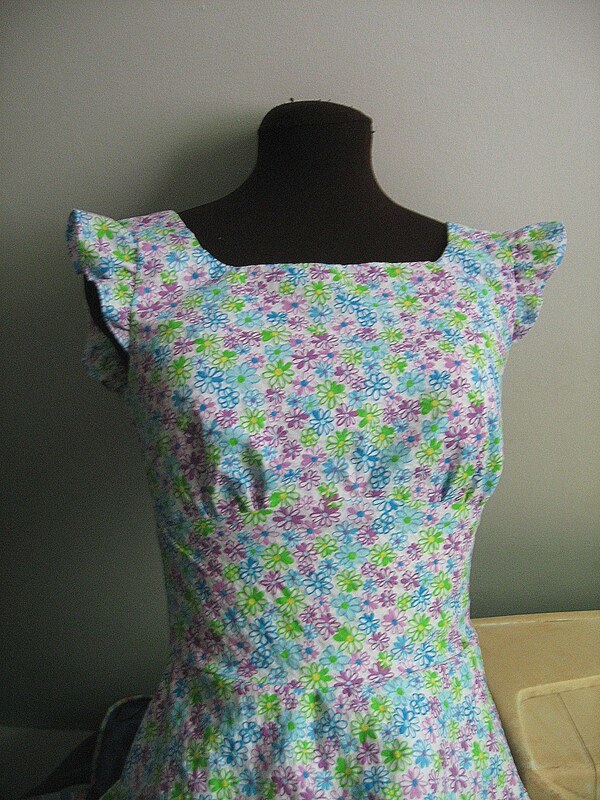 The print is very spring and summer.